There are some tackle differences that I have found to be very unique between surf and wade fishing. When you are surf fishing you'll want to use a 7-9 ft. rod with plenty of line so that you can throw the bait as far as possible into the surf. The weights that are used are much heavier and generally triangle shaped to hold the bottom against the strong currents. I prefer to use an open faced reel that is much larger than when wade fishing. I have seen many fisherman use the same rod and reel whether surf or wade fishing. I find it very difficult casting a 9 ft. rod in chest deep water all day. That is why I came up with this winning combination for wade fishing. My wade fishing rod is a 6 ft. Berkely Lighting rod, heavy-medium action. The reel is a Finn-Knorr Ahab #8. These reels are made in Ft Lauderdale and can be found at the local bait shops. It has the finest drag made, using a five ballberring system. I use a 15 lb. TriTanium mono by Sufix. This line is fairly new, but in my opinion, the best mono fishing line on the market. I've caught every kind of fish on this rig, including small sharks. It sounds light weight but believe me, it can take on the challenge. Though surf fishing and wade fishing are very similar, there are some distinct differences. 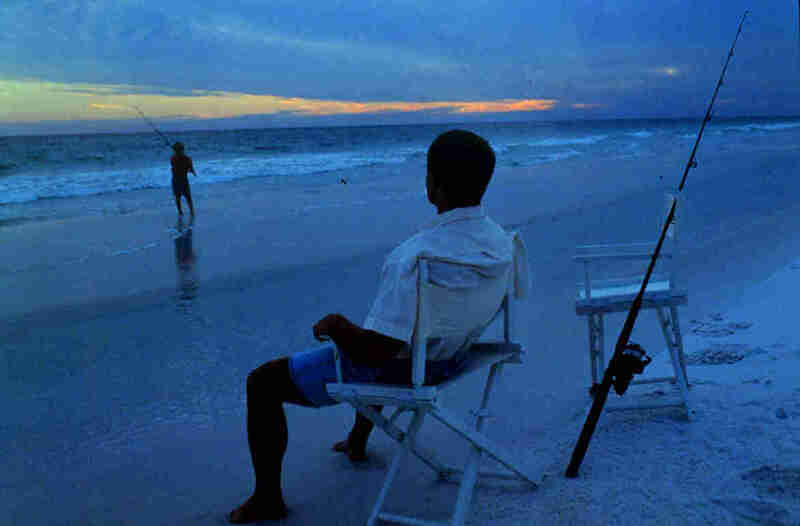 Surf fishing generally involves staying in one spot and waiting for the fish to swim by and take the bait. Wade fishing on the other hand intales walking chest deep in the water for long distances trying to locate the fish. Both are very effective ways for catching fish. Surf fishing and wade fishing can be done in the same general area, depending on the time of year. I prefer to wade fish and try to locate the under water feeding runs the fish follow.